I remember it like it was yesterday; I really do. The night my water broke at home while spending time with family is so fresh in my mind. What I remember most of all was the calm. Kissing my son goodnight before we left for the hospital and singing "You've Got a Friend In Me" one last time with him as my only child. Walking out to the car in cold darkness and listening to soft music on my iPod for the drive. I didn't know then that active labor was still a way's down the road. The night was spent pacing a quiet birthing floor with my husband and a dear friend or trying to sleep through some early contractions under my Mom's watchful eye. And the calm. Between the intensifying contractions was an inexplicable peace — like all these months had not merely been waiting, but preparing. The hours leading up to when I met my Beautiful Daughter on the morning of February 5, 2011, I thought back to the hours I spent in an indoor swimming pool during my eighth month. I would float on my back, glide through the water and rum my big tummy. There was a comoradory formed long before she came; maybe because we're both girls. I just remember saying so many times: "We're in this together, girl. You do what you need to do when you're ready and I'll take care of the rest." The laboring was not as difficult as I anticipated, thanks in no small part to my "team." When it finally came time to push, the sun was shining outside my window. Then she emerged and she was perfect. Like her brother, her eyes were wide and her skin so lovely. When they set her on my belly I was in love and reborn. That's what I never figured about motherhood: Every time they're born, you're born. Life starts over and continues on all at once. I had no idea what to expect from a daughter. My son was flat-out awesome...how would she compare? Beautiful Daughter, you made me a believer in little girls, with your hand-holding even as a newborn and your tiny moans that could never be confused for a boy's. I love the way you always want to be touching me somehow (I love it even when I act irritated). And the calm. You and I can still sit together in quiet, just like we floated in that pool, and enjoy the comfort of the present. Your eye contact and on-cue kisses melt my heart. Your rhythm and tenacity astonish and inspire me. I may not always be able to pick you up, but we'll always be able to hold each other. You do what you need to do when you're ready; I'll take care of the rest. My son's second birthday seems as good a reason as any to write for the first time in nearly a year. Today we celebrated two years of life with my little Mighty Warrior. It gave me pause to think about life before and life after him. You hear comparisons about how it feels to become a mother — going from black-and-white to color or, as seems more relevant today, 2-D to 3-D. It's all true. But what's harder to describe or pinpoint is when precisely the transition takes place. You could say it's the instant you see your child; maybe it is. Certainly the love at first sight is there. But whether you feel the Technicolor or 3-D right then depends on the person. Inevitably one day, not long after your first bundle has arrived, you have a moment to stop and think about the before and after. Before my son, I don't think that I knew true fear, true fearlessness, true sacrifice, true bliss — in a way, it's a bit like what C.S. Lewis called "the shadowlands." I had an idea of what all those things were, an even better idea once I got married. But parenthood took them to a new level. The true wonder of it all is when the before and after start running together...or is it they both dissolve? In either case, it's not that you can't remember life before your child (I know he wasn't with me at my first church camp), but more that you can't remember living without him. It's like the idea or promise of my son has been a driving force in my life since I myself was a child. Time almost seems irrelevant in his existence. Is it because life begins with motherhood? Is it because motherhood changes your view of life? I don't care which. I'm only grateful it happened to me. Since becoming a mother, I've been intrigued by romantic love songs that can double as mother/child love songs. This one, called "Fear of Heights" by Katie Melua, is my latest obsession. Lessons from the Lunch Room: Misc. • "Boys sure do come in strange packages" (that's a direct quote). • It's probably best not to accept Facebook friend requests from 56-year-old men you don't know. • Ignoring the person who's bugging you is the surest way to bug them. • There's no shame in asking for help, even if it's just to tie your shoe or open your milk carton. • Just because your brother is sweet and longsuffering doesn't mean you should take advantage by draping yourself all over him in front of his friends. Admittedly, I watched a LOT of television over the weekend...more than I usually do and probably should. I blame most of it on the NFL season's kickoff. I'm in a Fantasy Football league this year and it's taken my interest in the NFL from fascination to infatuation. Among those on my team are Tom Brady, Larry Fitzgerald and Ladanian Tomlinson. I'm still in negotiations to get the Steeler defense. Go Seahawks! I also watched the finale of HGTV's "Design Star" (yes, I'm a real Renaissance girl). Dan didn't win, but he should've. I realize he didn't have a lot of exciting tattoos or make a lot of jokes during his reveals, but the guy could design your socks off. (It doesn't hurt that I have a 2-degrees-of-separation connection with him, like I did with that guy who almost won "America's Most Beautiful Person.") Antonio (who prevailed) always had one or two great concepts with every design, but Dan came to play and out-concepted Antonio every time. The HGTV judges should have taken a cue from Food Network and awarded star status to the person with the overall most talent, even if they're not the most "camera-ready." 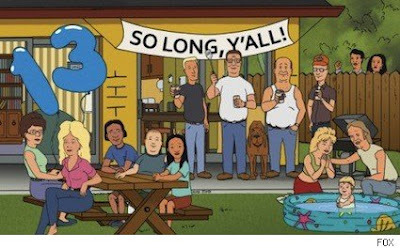 The best thing I watched Sunday was the series finale of the most underrated comedy on network television: "King of the Hill." I didn't get teary at the end, even though it was an exceptional finale (sitcoms, take note! ), but I did get a little sentimental thinking about Hank Hill -- arguably the most moral character on television is off the air and "The Family Guy," Hank's antithesis in every way, remains as popular as ever. Go figure. If you never got into "King of the Hill," I highly recommend you rent/Netflix/RedBox a season or two. I didn't have any interest in watching for the first few seasons it was on. But once you've seen a few episodes, you'll recognize the honest-to-goodness goodness and big heart of this little cartoon about a Texas family. 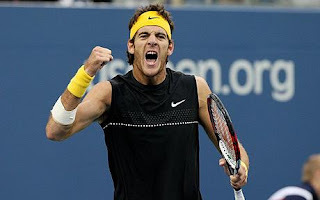 And lastly, a quick shout-out to Juan Martin Del Potro for doing the impossible and defeating Roger Federer at the U.S. Open. Hooray for the underdogs! First, and perhaps foremost, never (under any circumstances) allow a camera crew to follow your family around and air the footage as a reality show. This is one straight 2nd Cup of Coffee. Feel free to answer it in the comments or copy it on your own blog! 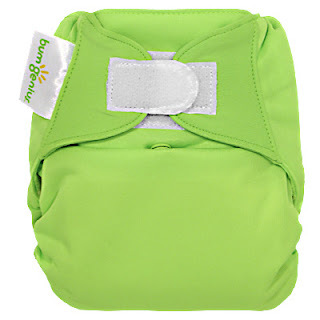 Parents Choice organic, biodegradable baby wipes. It's not easy being green..oh wait, it is! "Big Brother." I think I'd literally rather watch paint dry. Starting a magazine -- well it used to be, anyway, before I had to give it up. The people I wanted to be most excited about it were "ho-hum" and sometimes vice-versa. Oh well. As the Stones would say, "You can't always get what you want." Pretty much anything by Keane for the shower (their songs were tailor-made for awesome acoustics) and anything by David Crowder Band in the car. "Total Eclipse of the Heart" is pretty darn good, though. I am really not qualified to advise bloggers since I barely count as one! Reagan. And I would've been fine with it. But I love my name -- my real name. Word from the bank about a short-sale house we put an offer on. Boo short sales! It is probably cloth diaper paraphernalia. Two things: 1) I can be incredibly lazy and neglectful. 2) There is always something to write and write well about it if you're looking for it. I chose today's outfit based on what was clean and what looked nonpedestrian enough to wear in an elementary school cafeteria. I have exactly four shirts that fit the bill and two skirts (I need to hit Goodwill this weekend!). But it's a pretty little outfit, so I think it says "I feel pretty, Oh so pretty!" I've taken a very part-time job at a local elementary school as a lunch room monitor. That means I get to walk around with a walkie-talkie for about an hour and a half and make sure the kids get safely from the kitchen to their seats to the playground. It also means I interact with grade schoolers on a day-to-day basis. People are so interesting -- at any age. Boy 1: "That guy is telling everyone not to play with me." Boy 1: "That one" (pointing). Me: "Hey, you in the white T-shirt, come here...Are you telling people not to play with him?" Boy 2: "Because he came to my house and showed me something he wasn't supposed to and said something else he wasn't supposed to. That's all I can say because there's people around. But I'm just trying to warn my friends." Me: "This sounds like something you should discuss with the principal." Boys 1 & 2: "No!" Me: "OK...well, did he apologize for doing that?" Boy 1: "Yes I did!" Me: "Well, apparently he didn't hear you the first time. Why don't you apologize again." Me: "There. It's over with now. You (looking at Boy 2) don't have to play with him, but you need to stop telling other people not to." I never pegged myself as a cloth-diaper kind of gal. Until my husband and I went window shopping to price disposables before our son arrived. Talk about sticker shock! And then of course there are the statistics about how many thousands of icky diapers just one baby contributes to landfills. So now I am a cloth-diaper kind of gal. Which isn't as impressive as it was when we were kids. The ones they have now are so slick that they're almost as hassle-free as disposables. Not to sound too advertise-y, but I love these diapers. I can throw the whole thing in the washer and dryer, and the insides stay sparkling white not matter "what." And, if you use a flushable liner between the baby's bum and the diper (like these ones), there's hardly ever a need to swish in the toilet -- a phrase that strikes fear in my husband's heart. There you have it. 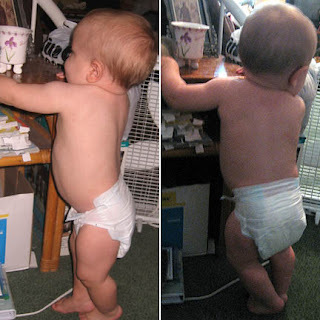 There are hundreds of Web sites and online communities devoted to cloth diapering; I'm not quite at that level. But we like them and they work for us. So I just thought I'd share. Exactly one year ago, we met for the first time and couldn't take our eyes off each other. Exactly one year ago, we were both puffy and tired and looked like we'd been through a war. Exactly one year ago tonight, I already knew your cry from any other baby's in the world. Exactly one year ago this minute, you were born and my life changed the instant I stared into those sweet baby blues. I love you, sweet boy! If only I had the eloquence to describe exactly how you've made my world 100% brighter and more meaningful in a short 365 days. Words just won't do. So I will have to resign myself to hugging and kissing you every day for the rest of my life. If he were born about 10 years earlier, I'd swear my kid was the prototype for "dancing baby" made famous by "Ally McBeal"
OK, that's not true at all. 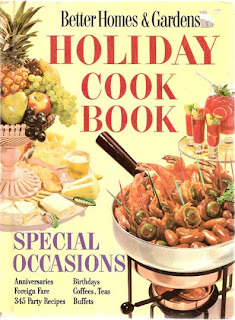 The cookbooks I like are old and idealistic. My husband is neither. But my Superman does have a few things in common with the vintage cookbooks I've developed a fetish for: Colorful, efficient and a good dose of eye-candy. 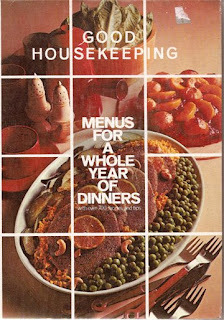 A year or so ago I was able to curb my seemingly insatiable appetite for old-time cookbooks of the '50s and '60s. I told myself to walk on by the book department at second-hand shops. I held off for a year. I knew it couldn't last. In case you can't read it, the passage says "To make Combination-salad Baskets (like those served at McDonald's Tea Room)..." Yes, because that's a timeless reference we all can understand! 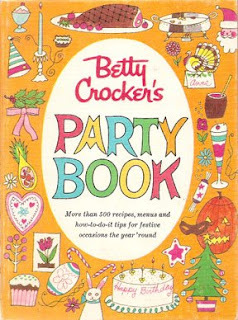 Another favorite of mine is the Betty Crocker party book. But the Better Homes and Gardens Salad Book just might take the cake for most creative (or weirdest) set of recipes. These folks were all about the gelatin molds! Check out this inexplicable idea for a salad. 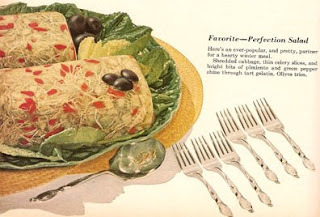 Shredded cabbage and gelatin ought never to be uttered in the same sentence. But then again, that's half the fun of these books. There is a fine line between polite and rude. Scratch that -- sometimes we get them downright backward. Back in college, I traveled to Scotland on spring break with three buddies of mine. We were fortunate to be able to stay many of our nights with friends of my sister (girlfriday). All these folks were inexplicably hospitable to four strangers -- a testament to my sister, no doubt. At any rate we felt right at home wherever we were and enjoyed their company immensely. One morning in Pencaitland, Mark (our host at that home) made us all coffee and a hearty breakfast. When we'd been eating for awhile, he asked if we'd like more toast. "No thank you, this is plenty." A few minutes later my friend and I passed through the kitchen on our way to the bathroom and noticed a stack of freshly buttered toast lying in a waste basket. I never forgot that. It is how I learned the hard way that politely refusing something is not always polite at all. Often the most gracious thing you can do is accept more. This past weekend, months of planning a high school reunion with three other girls came to fruition. I haven't processed it well enough yet to discuss much. But hosting a large event does give you a unique perspective into social morays. For instance, it is impolite to register and pay for an event but then not show up. "But I've paid and don't want my money back," you say. No matter. While we like having your money in the bank, it's no substitute for adding your warm body to our numbers. The night of our first event we had trays and trays of cookies, brownies and cupcakes leftover. Luckily we were able to finish them off at the next day's event. Then the next evening after about two and half hours at the semiformal dinner, nearly two-thirds of the crowd left to hit the club scene downtown. Again, it's really no skin off our nose financially that they left -- food has been bought and eaten. But we had planned music, dancing, etc. for an entire evening. So, the next time you're thinking of canceling your plans somewhere because you're sure there are enough other people attending or you're thinking of leaving prematurely because you've made an appearance, remember your hard-working hosts. 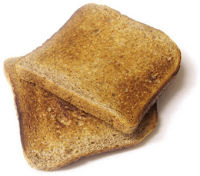 Please don't make us throw away the toast. 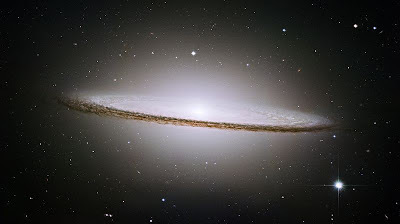 "As the music of the universe plays..."
I watched part of a special on PBS the other night called "Science and Song." It followed a group of scientists and Bobbie McFerrin as they explored the uniqueness of music to human beings and postulated on why it might exist. The discussions were evolution-based, of course, and the best guess they had was that music connects us to one another -- which makes it necessary from an evolutionary standpoint (I guess). But it went deeper than that. One scientist spoke of "The String Theory" and the idea that every particle of matter contains a string that vibrates, not unlike a piano string. So we essentially have music in us, which might explain how music can affect us so powerfully and make me want to weep after five measures of a cello solo. Not only that, but virtually everything in the universe emits its own pitch -- it's just so low that human ears can't hear it. Human ears can't hear it. A black hole, for instance, makes a B flat. But it's dozens of octaves lower than any B flat we play. 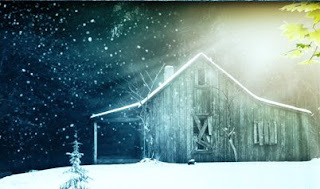 I've done it -- I have read "The Shack." The Christian work of fiction has grown exponentially in popularity since it was published just two years ago. I hadn't heard of it until last winter when a friend from my Bible study mentioned it. Once I started reading it, I was amazed at how many people I would talk to in passing who'd also picked it up. Its popularity hasn't come without its share of controversy, for reasons I won't go into here for fear of giving away too much. What you should remember going in, and keep in mind as you read, is that this is a work of fiction; it is essentially the author's imagining of what a conversation with God might look/sound/feel like. As long as you read it with that frame of mind you'll avoid the two extremes of either embracing it like the Gospel itself or rejecting it as presumptuous heresy. I throughly liked "The Shack." The questions it asks are important and the answers are provocative. 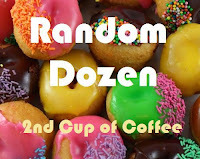 There are so many noteworthy themes — I can't even scratch the surface on this blog. But something that really resonated with me is the idea that legalism and ritual-based religion often amounts to a declaration of independence from God. How's that? Well, the more you take upon yourself to do in efforts to please God, the less you depend on Him; apart from Him we can do nothing, remember? As the book puts it, "independence is lunacy" when it comes to the way God created our relationship with Him to be like. And there's no point saying "God is my top priority," because how much Bible study/prayer/etc. is ever "enough"? The more we know God and give up our independence to rest in Him, the more He's in all of our priorities. There is certainly nothing wrong with church, a church building and church leadership. But rules and rituals have never healed any of humanity's wounds or brought us closer to God. Religion didn't die on the cross, Jesus did. As a perfect cherry-on-top to finishing the book, my husband and I visited a church Sunday while on vacation. It's as if the sermon was the bridge in a song I'd been learning while I read the book. Channeling your energy into whether you're keeping the Sabbath correctly or drinking alcohol too frequently just misses the point. There is no power in religious legalism but the power to bind ourselves. The heart of Christianity is a constant conversation with God — no folded hands or closed eyes necessary — and a surrender to grace. It is then and only then that our lights so shine before men that they see our good works and glorify the Father (not us). So consider that my book report for the year. "16 So let no one judge you in food or in drink, or regarding a festival or a new moon or sabbaths, 17which are a shadow of things to come, but the substance is of Christ. 18 Let no one cheat you of your reward, taking delight in false humility and worship of angels, intruding into those things which he has not seen, vainly puffed up by his fleshly mind, 19 and not holding fast to the Head, from whom all the body, nourished and knit together by joints and ligaments, grows with the increase that is from God. 20 Therefore, if you died with Christ from the basic principles of the world, why, as though living in the world, do you subject yourselves to regulations— 21“Do not touch, do not taste, do not handle,” 22 which all concern things which perish with the using—according to the commandments and doctrines of men? 23 These things indeed have an appearance of wisdom in self-imposed religion, false humility, and neglect of the body, but are of no value against the indulgence of the flesh." Flying by the seat of my pants, playing by heart, cooking with no recipe — just a full-time wife and mommy masquerading as a part-time writer. In no particular order, my favorite things are my husband, Jesus, my baby, morning tea, green, my wonderful family, words, my iTunes "Autumn Thoughts" mix, good journalism, theology, and the idea of sitting down to read.